You are here: Home / Healthy Living / What is “Real” Soap? What kind of soap is in your bathroom? The big name soap brands that we all know from the store are almost always detergents. Detergents are made of synthetic cleaning agents, and tend to be a bit more harsh so they can hold up in hard water. They rarely contain natural oils or glycerin, or very little of it, and almost never use lye which is required for the chemical reaction. Detergents tend to strip away all traces of oil with synthetic lathering agents. It’s not something you want to wash your face with! In contrast, real soap is a blend of fats that have been emulsified with lye. Lye (Sodium Hydroxide) is a product made from wood ash. It can be harmful to skin on it’s own, but it’s harmful properties go away in the in the soap making process. 1. Decreases your exposure to synthetic chemicals and toxins. Our skin is our biggest organ and acts like a sponge with anything that we put on it. It will also keep your skin in its best condition. 2. 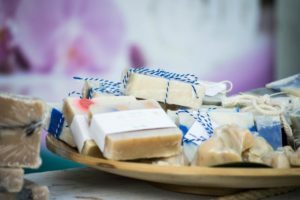 Real soap can be used not just for lathering up in the shower, but also as a makeup remover, as a shaving cream/lotion for both men and women. It can simplify your bathroom routine! 3. It’s better for the environment as its production is done with natural ingredients. 4. You can use it to clean your whole house: Liquid soap can be diluted with water in a spray bottle to clean counters and mop the floor.